adidas in partnership with Real Kashmir FC organised a unique photo exhibition in Bengaluru titled ‘The Real Kashmir’ to reveal the real side of Jammu & Kashmir. The photo exhibit celebrated the beauty of the state through the lens of football. The photo exhibit is a celebration of the wave of positive change brought about by Football in Jammu & Kashmir. 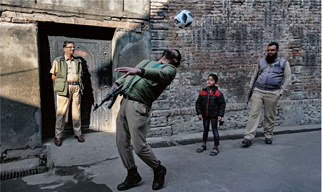 The pictures captured not only show the magnificence of the valley but also portray how young kids in Jammu & Kashmir are taking to football on the streets and following their passion for the game. The pictures have been shot through the lens of Prashant Godbole. His proficiency reveals an untold story which is bound to catch the eye of the public at large, thereby showcasing the unseen and fascinating side of Jammu & Kashmir. The exhibition witnessed a display of pictures bringing to life the "real” Kashmir. From youngsters honing their football skills in the streets of Downtown, Srinagar to the youth academy prospects of Real Kashmir FC taking a leap of faith with the beautiful game on the snow-capped peaks of Gulmarg - the pictures reinforce the wave of positivity that football has brought to Jammu & Kashmir. The photo was held from January 24th to 27th at Rangoli Metro Art Centre, Bengaluru.